Os jovens, a par das mulheres por exemplo, sempre constituíram um grupo particularmente vulnerável ao desemprego. Um risco que não só se manteve como se multiplicou nos últimos dois anos, resultado da crise financeira que, entre outras consequências, veio elevar os níveis de desemprego juvenil para números recorde (27,8% para o grupo dos 15 aos 24 anos e 14% para o grupo dos 25 aos 34 anos registados no 1º trimestre de 2011 segundo o INE). Contudo, caracterizar a relação dos jovens com o mercado de trabalho não se esgota na análise do acesso ao mercado (claramente mais difícil do que para outros grupos etários), devendo estendender-se para os problemas relacionados com as modalidades de manutenção dos jovens empregados no mercado de trabalho. É neste quadro, justamente, que surge o termo «precariedade», que refere genericamente uma tendência para a fragilização crescente das relações laborais por contraste com a estabilidade contratual que beneficia os escalões etários mais velhos. Ora o problema é que o termo «precariedade», que se tornou num tema recorrentemente debatido no espaço público, engloba um conjunto muito diversificado de situações (subemprego, emprego intermitente, temporário e/ou a prazo, «falsos recibos verdes», etc. ), como carrega uma carga negativa e estigmatizante que o enfraquece como conceito. A somar a estas dificuldades acresce uma realidade difícil de medir, em parte devido à natureza oculta de algumas das manifestações da fragilidade das relações laborais. Importa pois perceber e analizar tendências, factos e consequências neste domínio para se poder discutir com base em dados objectivos o alcance do fenómeno no nosso País, situando-o simultaneamente no espaço europeu. Só assim se pode realmente discutir de que modo o acesso a patamares de estabilidade laboral (in)capacita os jovens portugueses nas suas transições, isto é, na construção dos seus percursos de vida. Olhando a evolução dos contratos dos trabalhadores por conta de outrem, que logo à partida se revela um indicador frágil uma vez que deixa de fora importantíssimas expressões deste fenómeno como os «falsos recibos verdes» ou mesmo a ausência de qualquer tipo de relação laboral formalizada, constata-se o seu aumento significativo confirmando o sentido da tendência tal como é descrita no espaço público e mediático. Todavia, apesar de mais frequente entre os jovens, não é um «problema» exclusivo deste grupo: entre os trabalhadores com mais de 35 anos verificou-se também um aumento expressivo dos vínculos temporários (de 11,3% para 19,8%). Já no quadro comparativo europeu Portugal é, com Espanha, um dos países da EU onde mais jovens que estão no mercado de trabalho possuem vínculos laborais com termo e onde, simultaneamente, o desemprego juvenil é mais elevado, o que sublinha a mais frágil relação dos jovens portugueses activos com o Mercado de Trabalho quando comparado com alguns dos seus pares europeus. Mais, a fragilidade laboral dos jovens portugueses persiste até mais tarde no ciclo de vida quando comparado com outros contextos europeus, onde a precariedade tende a ser mais transitória. Contudo, a flexibilização das relações contratuais, mais do que ter uma expressão quantitativa crescente da vulnerabilidade, tanto em Portugal como noutros contextos, deve ser olhada também na sua dimensão qualitativa, pois é esta que nos informa de que modo ela é experienciada pelos jovens. Verifica-se assim que se noutros países europeus a fragilidade dos vínculos contratuais é uma realidade tendencialmente transitória (cobrindo, por exemplo, períodos de formação) ou mesmo desejada no quadro de estilos de vida que se desejam flexíveis, em Portugal, como em Espanha, ela é sentida sobretudo como um constrangimento, uma inevitabilidade indesejada. Estes dados fornecem assim indicações sobre a natureza dos obstáculos que tal realidade impõe para aqueles que buscam aceder a mais estáveis patamares de independência financeira. The Great Recession in the United States, which lasted eighteen months, the longest downturn since the 1930s Depression, was declared over and done as of July 2009. The economy has been growing, albeit slowly, since then, and the output of goods and services (Gross Domestic Product or GDP) has returned to pre-recession levels. U.S. corporate profits have soared, and most of the big banks, after being bailed out, have been making piles of money. However, rising production and profits have not been accompanied by the return to work of millions of unemployed people, many of whom have been out of work for numerous months and have little prospect of future employment. This essay will focus on the jobs disaster in the United States, although the problem is global. The United States is where the crisis began, and it is still the world’s richest and most powerful nation. What happens here has serious repercussions for everyone in the world. In addition, the disconnect between economic reality and the propaganda of recovery is greatest in the United States. So a close examination of what is happening in this country is instructive, not just for those of us who live here, but for those in the rest of the world as well. If we focus our attention on the conditions of the working class, of ordinary men and women, it is impossible to argue that the Great Recession is over. In the “recovery” year of 2010, approximately one and a half million people declared bankruptcy, banks repossessed one million homes, nearly three million homeowners received foreclosure notices, record numbers of people (some forty-three million) received food stamps, and more than twenty million people remained unemployed and underemployed. Let us take a closer look at the labor market. Over eight million jobs were lost at the height of the recession, but only about one and a half million jobs have been added since the recession’s trough, enough to keep pace with the increasing number of working age people but not enough to make much of a dent in the rates of unemployment and underemployment. What is more, some six million people—or 45 percent of the approximately 13.5 million officially unemployed—have been without work for more than twenty-seven weeks. In March 2011, two years after the beginning of massive job losses, there were an estimated two million people who had reached the maximum ninety-nine weeks during which they were allowed to receive unemployment benefits, a number that is expected to grow dramatically in the coming months. 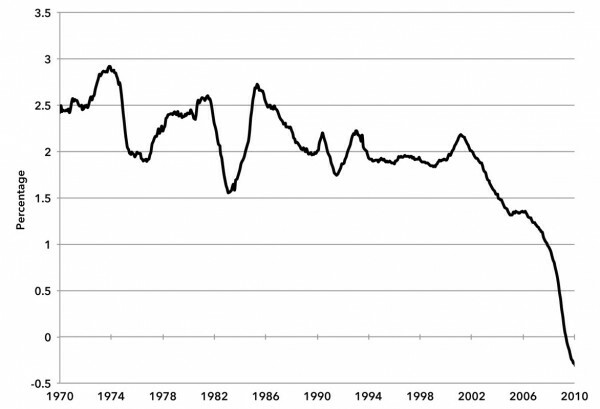 There has not been such severe long-term unemployment since the 1930s. The official U.S. unemployment rate was over 9.0 percent for twenty-one straight months (through January 2011), dropping slightly below this level in February and March only because thousands of people, having become so discouraged that they stopped looking for work, were no longer considered unemployed. This figure still leaves 13.5 million people considered officially unemployed. However, double that number—a total of twenty-eight million people—want to work (or need full-time jobs instead of part-time ones) (see Table 1). The labor force participation rate, which indicates the fraction of the “non-institutional” working-age population in the labor force, shows what is happening. This rate has been declining for some time, meaning that people have been dropping out of the labor force. The rate was 67.3 percent in April 2000, but only 64.2 percent in January 2011. The Great Recession and its aftermath have particularly affected young people, African-Americans, and those with lower levels of education. Nearly 25 percent of sixteen-to-nineteen-year-olds were unemployed in March 2011. At the same time, the rate of unemployment among blacks was 15.5 percent, approximately double that of whites (7.9 percent). For those with less than a high school diploma, the unemployment rate in March 2011 was 13.7 percent, while for those with a college diploma or graduate schooling, it was 4.4 percent. Prospects for those seeking employment, although improving from the depths of the recession, are still very difficult. This is especially so for the long-term unemployed because companies are discriminating against these workers. 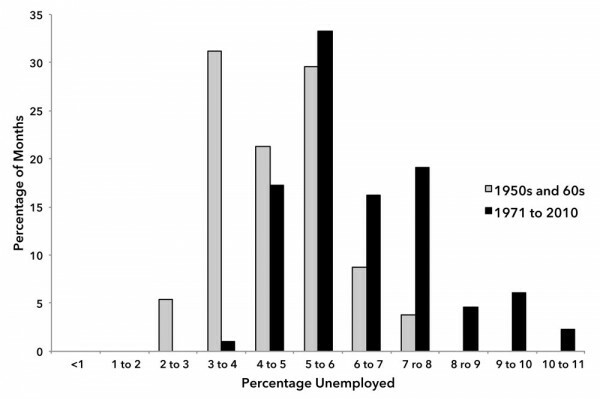 At the start of 2011, there were more than four unemployed persons per job opening. The long-term unemployed suffer both economic hardship and severe psychological problems, and they rightly fear that the longer they are unemployed the harder it will be to get a job. The economic insecurity they and many others face is creating profound negative effects on many people, and there are indications that suicide rates have increased over the last few years.1 Approximately one-third of the unemployed are not receiving any sort of unemployment benefits because they are not eligible for the unemployment insurance program. Even those with higher levels of education are finding it difficult to obtain employment once they have lost a job. Source: U.S. Dept. of Labor, Bureau Economic Research, “The Employment Situation—March 2011,” Tables A-1 and A-8, seasonally adjusted. It must be noted, too, that a high level of unemployment means those with jobs suffer as well; they are always fearful they will lose their jobs or see their wages and benefits shrink. Those returning to work after being unemployed are finding lower salaries. As a Wall Street Journal headline put it, “Downturn’s Ugly Trademark: Steep, Lasting Drop in Wages.”2 Of those able to find work, over half are earning less than they did at their previous job. Remarkably, real average weekly earnings of production and nonsupervisory workers have been falling, even as the economy is recovering. Some economists and reporters are talking of a “new normal” labor market situation, in which high rates of unemployment will persist for many years to come. There have been twelve recessions since the end of the Second World War and five over the last three decades. Following most post-Second World War recessions, the economy recovered rapidly, with lost jobs returning fairly quickly. For example, in the relatively typical recession that began in 1974, it took nineteen months to get back to pre-recession numbers of jobs (Chart 1). However, in the 2001 recession—although not a very severe one—it took a post-Great Depression record of forty-seven months to return to pre-recession employment. In the wake of the 2007-2009 recession—deeper than other post-Second World War recessions—there appears, as of March 2011, a very long way to go to get back all the lost jobs (Chart 1). Source: Calculated from All Employees: Total nonfarm employees (PAYEMS), downloaded from St. Louis Federal Reserve FRED database, http://research.stlouisfed.org. So why do conditions this time appear especially tough—with little evidence of jobs rapidly returning, even though the output of goods and services has returned to pre-recession levels? How did all this come about? Is it due to long-term changes and trends, or just some recent mischief and misbehavior by banks, Wall Street, and other parts of the financial sector? Before discussing the current situation in more detail, let us take a look back to the “golden” era of the 1950s and ’60s and what has occurred since, including the two most recent recessions, those of 1990-91 and 2001. In the mid-1960s, Harry Magdoff described the prevailing beliefs regarding the U.S. economy as follows: “Wave upon wave of prosperity, accompanied by ever higher levels of production and consumption, nourish the belief that the U.S. economy has found new sources of strength and that remaining weaknesses can be fairly easily overcome.”3 These “golden” years of the 1950s and ’60s were special, with relatively high rates of economic and job growth, but they were not as successful as believed, nor did they portend a coming era of perpetual high growth rates. A number of forces propelled the economy during the years following the Second World War, increasing the number of jobs and pushing wages higher. These included the pent-up civilian demand (and savings) built up during the War; the stimulus from helping to rebuild Europe; both the direct stimulus and side-effects arising from the increasing dominance of the automobile in transportation (including the growth of suburbs and the building of the huge interstate highway system, development of motels, fast-food restaurants, and the like); the needs for new housing with the forming of many new families after the delay occasioned by the war; and the baby boom itself. For twenty-seven years, starting in 1947, the population grew at an average of almost 1.7 percent a year, with a maximum of a 2 percent increase from 1949 to 1950. Procurement for the Korean War also provided a significant stimulus to the economy during this period. By the mid-1960s, spending for President Johnson’s “Great Society” programs and, by the end of the decade, for the war against Vietnam, provided additional economic stimulation. A strong union movement—numerically, in terms of union members, and in support from the public—helped workers in their struggle to increase wages and benefits. And this had real positive “trickle down” effects on lower-wage, nonunion workers. Although government spending stimulated both the private economy and job creation, direct government employment provided a significant number of jobs. During this period, local (especially) and state governments created many jobs to staff new and expanding schools, police and fire departments, and other public services. The growth of public employment was substantial—providing nearly one-quarter of all jobs that were added to the economy during the 1960s. During the 1950s and ’60s, unemployment rates were relatively low. For close to 40 percent of the period, unemployment was less than 4 percent. And for a short period during the Korean War, unemployment was below 3 percent, probably as close to full employment as we can get in the United States. Despite reduced economic growth following the “golden” decades and a litany of significant financial crises and recessions, people came to believe in the late 1980s and ’90s that the economy “had found new sources of strength and that remaining weaknesses” could be easily overcome. A permanent “Great Moderation” had taken hold. They believed that the new computer technologies and a variety of business techniques were making deep crises a thing of the past and business cycle crises easy to deal with by using federal monetary and fiscal policies. It has taken awhile for a day of major reckoning to appear. Measures that government and business took to fight each crisis helped the working population to some extent (though real wages stagnated and household debt rose), but they also helped create conditions that led to the next crisis. The basic structural problems remained. Slow economic growth engendered financialization of the economy because finance is where “real” money could be made. In making money only with money, no product or service is provided. “Something for nothing. It never loses its charm,” as Michael Lewis put it. However, financialization went hand in hand with, and was partly responsible for, the return to the large inequality of income and wealth last seen in the late 1920s. This, in turn, reinforced the slow growth tendencies, once the piles of new debt accumulated by those whose incomes were falling began to default and the massive speculation spurring all the debt along could no longer be sustained. The trend over the past three decades seems to be bubble-crisis-bubble: the 1987 stock market crash; followed by the savings and loan banking crisis (late 1980s to mid-1990s, contributing to the recession of 1990-91); the Mexican economic crisis (1994); the Asian financial crisis (1997); the collapse of the Long-Term Capital Management hedge fund (1998); the 2000 bursting of the dot-com bubble (leading to the 2001 recession); and, finally, the housing bubble bursting (pointing to the Great Recession that began at the end of 2007). All the while, powerful financial interests were able to push through their deregulation agenda, giving them increasing freedom to create a vast array of financial products and to speculate without adult supervision—increasing the likelihood of more bubbles and crises. As stated above, there were props that kept crises at bay for a while. One was “defense” spending. Government hiring, almost exclusively by local and state governments, added approximately ten million jobs. However, trouble was always brewing. Real GDP grew at an average annual rate of 5.9 percent in the 1940s, 4.2 percent in the 1950s and ’60s, 3.4 percent in the 1970s, 3.2 percent in the 1980s and ’90s, and 1.9 percent during the first decade of the twenty-first century. If we look at the differences in the job situation between the 1950s and ’60s and the last four decades, we see a striking disparity in the length of time that unemployment was in certain ranges (Chart 2). During the former period, there were recessions, but they were usually of short duration, and employment tended to bounce back quickly. And, as mentioned above, for about 40 percent of the time, the unemployment rate was below 4 percent, reaching less than 3 percent for a short period in the early 1950s. Contrast this with the situation of the 1970s through 2010, when unemployment was very low (less than 4 percent) for less than 1 percent of the time, and 6 percent or higher for over half of the time. Add to this the related stagnation in real wages and, to put it mildly, this was not a favorable forty-year period for labor. Families were able to maintain or increase their living standards by having more two-earner households, working longer hours, and taking on increased levels of debt. Source: Calculated from Civilian Unemployment Rate (UNRATE), downloaded from St. Louis Federal Reserve FRED database, http://research.stlouisfed.org. A new phenomenon appeared in the 1990s. The recession in the early decade, from July 1990 through March 1991, produced a “jobless recovery”; it took thirty-one months for jobs to return to pre-recession levels. And the short period of rapid growth of jobs that did occur in the mid-1990s through 2000 was fueled by an enormous jump in debt and the spending associated with the dot-com-induced stock bubble. The amount of debt driving the system is hard to imagine. From 1996 to 2000, all debt (personal, business, and government) increased by an average of over $1,600 billion ($1.6 trillion) per year—with increasing household debt alone averaging over $400 billion per year—at a time when the GDP was growing at an average rate of about $500 billion per year. 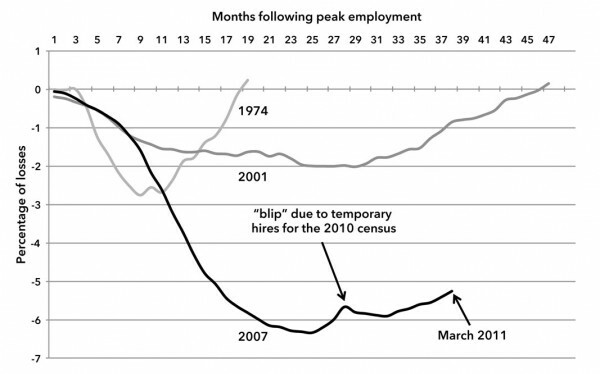 The recession of 2001 lasted for eight months, but, as indicated in Chart 1, its effects lingered for many years and produced a second “jobless recovery.” The economy grew so slowly after the 2001 recession ended (real GDP growth averaged 2.7 percent for 2002 through 2006) that it took nearly four years to gain back the jobs that had been lost—the most time to recoup jobs lost by an economic downturn since the Great Depression. The recovery of private sector jobs to pre-recession levels took even longer—fifty-four months. Some of the growth that did occur in this period resulted from the large expansion of the defense budget when military spending skyrocketed as the “War on Terror”—mainly the Afghanistan and Iraq wars—was pursued, following the events of September 11, 2001. But the “recovery” from the 2001 recession was stimulated mainly by increasing levels of debt and speculation, this time primarily taking the form of a housing bubble and building boom. The significance of the debt explosion to the stimulation of growth and speculation cannot be stressed too strongly. From 2001 through 2007 the average annual increase in debt in all sectors of the economy was a staggering $3,000 billion ($3 trillion) per year—with household debt alone increasing by over $900 billion annually—while the GDP increase averaged less than $600 billion per year. An inherently unstable situation develops when, over a period of years, total societal debt greatly outpaces economic output. Only one and a half years after the level of employment reached pre-2001 recession levels, the bottom seemed to fall out of the economy, as the financial crisis began. Today, there is the renewed mantra, accepted by almost all politicians, that we must reduce the federal deficit as soon as possible. The result will be a more precarious existence for the most vulnerable—the unemployed or employed in low-wage jobs already living in difficult conditions—as well as for workers higher up the wage scale. The huge deficits in many state and local governments were papered over for two years by the infusion of funds from the federal government “stimulus” program that runs out in the spring of 2011. Thus, the wave of public job losses will continue to grow. And the movement to reduce or eliminate the bargaining power of public sector workers means that the battle of Wisconsin, although in the short run lost by workers, may lead to a prolonged struggle. Regardless of whether or not labor is able to win some of the battles, the conservative political resistance to obtain sufficient funds from “where the money is” (corporations and the wealthy) indicates that the numbers employed by the public sector will continue to decrease or, at best, stagnate. One might think that the past decade would have been a disaster for U.S. business—economically and politically. After all that has been revealed regarding the shenanigans and criminal activities of banks and corporations, one would think that the credibility of the business sector would have decreased. However, with the national government bailing out the financial system and saving key industries from failure, most wealthy business owners and top managers—although scared to death by what seemed to be a real possibility of the Great Recession turning into a depression—still have their wealth and businesses intact. The great inequality of income and wealth was preserved, as was the power of capital to direct rules, regulations, and propaganda in its favor. Companies learned to go lean and mean during the recession, restructuring operations, firing employees, and requiring those remaining to do more with less. And in the process, many profited, especially during the so-called recovery that began in July 2009. At the end of September 2010, corporations had done so well they were sitting on some two trillion dollars of cash.7 Without profitable outlets for their investments when faced by a weak economy (even if no longer in an actual recession), companies either sit on cash, buy other companies, give out dividends, or buy back stock to help enhance share value. The economy was in recession during one-fifth of the past decade—some twenty-six months—and the period ended with approximately 131 million people employed, fewer than the number employed in January 2001. The consequences of a decade of zero growth of jobs have been, as we have seen, catastrophic for many people. At the time of this writing, in early 2011, it is apparent that the government sector will not be a source of many new jobs for years to come. The disastrous financial conditions of many state and local governments mean that the only issue is how many jobs will continue to be shed from this sector. So that leaves the private sector, and the recent record of private employment generation has been abysmal. The ten-year moving average growth in private sector jobs was around 2 percent a year during the late 1980s and for the 1990s, but started to decrease in 2002, following the 2001 recession, and continued to plunge, reaching zero in 2009 (Chart 3). Source: Calculated from All Employees: Total Private Industries (USPRIV), downloaded from St. Louis Federal Reserve FRED database, http://research.stlouisfed.org. Thus, the private sector produced fewer and fewer jobs as the decade proceeded, and the implications for working people are serious. Although public sector employment, as one would expect, showed more stability at the beginning of the crisis, it too has weakened, as state and local governments have found themselves facing deep fiscal crises, and as the right-wing attacks on public sector employees have accelerated. For large numbers of jobs to be added by the private sector, the growth of GDP needs to be in the range of 3 to 4 percent or above. It is not at all clear that the economy can sustain this rate for sufficient time to dig out of the job hole that has been created. As indicated in Table 1, there are some twenty-eight million people who do not have jobs and want to work (or work part-time and want full-time work), with 13.5 million of those officially considered to be unemployed. To put this in perspective, employment by private companies in March 2010 was less than 110 million. It is almost unimaginable that the private sector can create 13.5 million jobs in the foreseeable future, let alone the twenty-eight million needed to provide jobs to all who want work. The difficult economic situation and its implication for workers did not happen overnight—or even over a few years, or because of the subprime mortgage fiasco. We have reached this point because of decades of capital (and the government) trying to overcome stagnation’s limits to finding profitable investment outlets. In the process, the financial sector became ever larger, creating an increasingly fragile economy, dependent on new infusions of debt, made more precarious because debt was growing so much faster than the economy and because so much of it was being used for speculative purposes. For the last half-century, as noted above, the financial explosion was behind much of the economic growth. The total debt in the U.S. economy went from around 150 percent of the GDP in the mid-1980s to well over 300 percent by the beginning of the Great Recession in December 2007. Although some debts are being erased, either through paying them off, home foreclosures, or bankruptcy (“deleveraging,” in the parlance of economists), it is questionable that things have reached the stage in which increased financialization can get things going once again. It is unlikely that a large expansion in household debt can occur until personal debt loads are reduced further than they have been already (from close to 100 to about 91 percent of the GDP). And since consumer purchases account for about two-thirds of the economy, lack of growth of wages as well as difficulty increasing consumer debt does not bode well for this sector’s contribution to stimulating sufficient new growth. If it cannot, then what is there in the real economy that might provide the rapid sustained growth needed to produce sufficient jobs to reach something close to full employment? Although the federal government is likely to spend more than it takes in for a long time to come, largely because of decreased revenues, political considerations make it unlikely that there will be an expansion of national government debt for the purpose of stimulating the economy. In addition, state and local governments will most likely be areas of job losses for some years. The goods-producing industries—manufacturing, mining, forestry, and agriculture—have generally lost jobs over the last half-century and so it has been in the service sector that employment growth has occurred. Although manufacturing will add jobs as the economy slowly recovers, job growth in new manufacturing ventures to produce goods for the U.S. market is occurring mainly abroad. The hoped-for effects of the Federal Reserve’s 2010 to mid-2011 program of “quantitative easing”—essentially printing money to ease the financial crisis—are to prop up the stock market and to lower the value of the dollar in order to make U.S. exports more attractive. It is extremely doubtful, however, that this kind of monetary strategy can, by itself, create the kind of growth needed in order significantly to alleviate the pitiful job situation. In order to create a lot of new jobs annually over a period of decades, the United States needs a truly epoch-making new technology like the railroad or the automobile-highway-suburbanization complex, which can shake the economy out of its tendency to stagnation. Computers, the Internet, smart phones, iPads, etc. have certainly changed the way we live and work, but they have not resulted in a major self-sustaining and society-wide stimulation of job growth. Partly this is due to production abroad and to labor-saving effects of computerization in some economic sectors. While it is impossible to know what lies ahead, there is no technology or grouping of technologies—and that includes “green” energy—that appear capable of supplying the impetus to begin and maintain a long wave of rapid growth. Given the lack of another government “stimulus,” the shedding of jobs from state and local governments, and the inability of the private sector to produce an adequate number of jobs, slow economic (GDP) growth will probably continue to provide a low quantity of relatively low-paying new jobs. A prolonged sluggish economy with high rates of unemployment may well be the “new normal.” With the private sector seemingly unable to provide sufficient new jobs to employ those who want and need employment, a new Depression era WPA-like government jobs program is desperately needed, as is increased funding for programs to help the poor. Any such jobs program must aim to provide essential public services, including high-quality housing, schooling, health care, protection for the environment, public spaces, and income security. It must be aimed primarily at those most harmed by our jobs crisis. It also needs to include an unconditional amnesty for undocumented workers, who have been disproportionately hurt by the Great Recession and who have been viciously scapegoated and hunted down, imprisoned, and deported. Finally, it must also be accompanied by significant constraints on the finance capital that has been moving its money around the world and creating in its wake immense amounts of human misery. The current political climate makes all of this unlikely to happen. A mass movement, capable of forcing action will be necessary for such truly radical change to occur. The recent struggles by public workers in Wisconsin and a few other states might rekindle such a movement. What has been interesting and hopeful about these struggles is how they took inspiration from the revolt in Egypt—where workers actually sent solidarity messages (and pizza) to Madison, Wisconsin. We live in a world in which working-class misery and working-class responses to it are increasingly interconnected. Even though we must, for the most part, confine our battles to our home terrain, we can take heart in the fact that workers around the world are beginning to fight back. ↩ Jacob S. Hacker, Philipp Rehm, and Mark Schlesinger, “Standing on Shaky Ground: American’s Experiences with Economic Insecurity,” The Economic Security Index and the Rockefeller Foundation, December 2010. Annual suicide rates were approximately 11.0 per 100,000 in the early part of the decade, 11.5 in 2007, and 11.8 (preliminary figure) for 2008. ↩ Sudeep Reddy, “Downturn’s Ugly Trademark: Steep, Lasting Drop in Wages,” The Wall Street Journal, January 11, 2011. ↩ Harry Magdoff, “Problems of United States Capitalism,” Socialist Register (1965), 62-79. ↩ Harry Magdoff and Paul M. Sweezy, The Irreversible Crisis (New York: Monthly Review Press, 1988), 76. ↩ Carl Bialik, “Housing Statistics Hit Rough Waters,” The Wall Street Journal, January 8, 2011. ↩ Justin Lahart, “Companies Cling to Cash,” The Wall Street Journal, December 10, 2010. ↩ Neil Irwin and Sonja Ryst, “GDP Report: Economic Growth Slows with 2 Percent Rate in Second Quarter,” The Washington Post, July 31, 2010. ↩ United States Bureau of Labor Statistics, Occupational Outlook Quarterly, U.S. Department of Labor, Winter 2010-11. This can be downloaded at http://bls.gov. O Eurostat confirmou hoje que a taxa anual de inflação na zona euro fixou-se em 2,7% no mês passado. O gabinete de estatística europeu revelou hoje que os preços nos países que usam o euro subiram 2,7% em Maio, face ao mesmo mês de 2010, o que representa um abrandamento face ao aumento de 2,8% (a taxa mais elevada em dois anos e meio) registado em Abril. É a primeira desaceleração em nove meses. Este valor confirma a estimativa rápida avançada a 31 de Maio. O abrandamento da inflação no mês passado surpreendeu os economistas sondados pela Bloomberg que projectavam uma manutenção da taxa nos 2,8%. Apesar do abrandamento da inflação na zona euro, a taxa permaneceu pelo sexto mês consecutivo acima do limite de 2% em que a instituição liderada por Jean-Claude Trichet considera existir estabilidade de preços. Em Maio, a inflação em Portugal atingiu os 3,7%, o quinto valor mais elevado entre os países do euro, ao lado da Áustria, segundo o Eurostat. As taxas mais elevadas no euro pertencem à Estónia (5,5%), Eslováquia (4,2%), Chipre (4,1%), Luxemburgo (3,8%). No relatório, o Eurostat destaca as subidas dos preços dos transportes (5,3%), da habitação (4,7%) e do álcool e tabaco (3,3%) na zona euro, no mês passado. Num ano com 365 dias de calendário descontemos os sábados, os domingos, os feriados e o período normal de férias. Multipliquemos o resultado por oito horas diárias de trabalho. Encontrado esse valor dividimo-lo pelo salário ganho pelo senhor Zeinal Bava, presidente executivo da Portugal Telecom. À seguinte conclusão: o senhor Zeinal Bava, em 2010, teve um salário de 1.416.959 euros, o que significa que, porcada hora de trabalho,recebeu 777 euros, ou seja, cerca de 13 euros por cada 60 tiquetaques de segundo. Mas ele, com tal salário, não está só. Por cada hora de trabalho o senhor Ferreira de Oliveira da GALP, ganhou 733 euros, o senhor Ricardo Salgado do BES(o banco que está em tudo o que seja processo mediático no âmbito do Ministério Publico), ganhou 669 euros, o senhor Paulo Azevedo da Sonae, ganhou 616 euros, ou seja, valores simultaneamente correspondentes a uma hora de trabalho para alguns e valores superiores àquilo que a generalidade dos trabalhadores recebem durante um mês. Se há forma de explicar, em linguagem simples, a dimensão da extorsão da mais-valia, o exemplo atrás referido é exemplar. Mas se, a tais gestores, juntarmos os restantes presidentes executivos das empresas do PSI 20, a soma dos salários desses vinte magníficos atinge 15.131.839 euros de remuneração, valor que constitui uma pequena amostra relativamente à dimensão dos altos rendimentos existentes em Portugal. Com efeito, em 2009, não incluindo aqueles que por via dos off-shores, da engenharia fiscal e de outras manhas fugiram à declaração de rendimentos em sede de IRS, houve oficialmente, embora sub-avaliado pelas razões atrás referidas, 150 agregados familiares que declararam um rendimento anual superior a um milhão de euros, a que acrescem 19.433 famílias com um rendimento anual balizado entre os 141.500 e 1.000.000 de euros, facto que é omitido nos comentários dos ideólogos da ganância do Compromisso Portugal e do respectivo sucedâneo, de nome Mais Sociedade, personagens predominantemente ligadas ao PSD e a vira-casacas do PS. Estas personagens, que ocultam a dimensão dos rendimentos mais elevados, são os mesmos que reclamam a diminuição do número de escalões do IRS, afectando a progressividade do imposto, ao mesmo tempo que consideram uma injustiça de bradar aos céus a existência da taxa máxima de 42%. Mas quem é que, em Portugal, vê aplicada aquela taxa? Os 500 arguidos do processo Furacãono qual estão envolvidos os maiores bancos privados portugueses? Os clientes, em Lisboa, do Banco Edmond de Rothschild, que subtraíam nas declarações de rendimentos os lucros derivados das suas aplicações financeiras, facto que está a ser investigado pelo Ministério Público? O senhor João Rendeiro do Banco Popular Português? O senhor Oliveira e Costa do Banco Português de Negócios? O senhor Leite de Campos, vice-presidente do PSD que em declarações à SIC declarou, falsamente, que aqueles que «só ganham 10 mil euros por mês e que, com os 42% que o Estado lhes reduz, ficam com uns miseráveis 5 800 euros ...»? O senhor António Carrapatoso, chefe da Vodafone, figura de proa dos conclaves atrás referidos e presença assídua dos meios de comunicação social, que em 2000 ficou a dever ao fisco uma dívida de cerca de 740 mil euros? Do que se sabe é que tal dívida, tendo prescrito, deu origem a uma auditoria interna nas finanças, de que resultou o envio, em 2005, de um relatório ao «representante do Ministério Público do Tribunal Judicial de Oeiras com o objectivo de apurar eventuais responsabilidades criminais». ão sabemos a que conclusão chegou o Ministério Público, embora a dívida tivesse, com imenso atraso, sido paga, graças, estamos certos, à denúncia havida na comunicação social. Este caso foi, com atraso, resolvido. Mas quantos não terão passado nas redes do fisco, tecidas por forma a apanhar o peixe miúdo e a deixar passar os grandes tubarões, muitos dos quais integram a lista dos 11mil milionários existentes em Portugal? Situações similares a esta, com a ajuda das deduções fiscais que beneficiam os mais ricos, explicam a inexistência prática da taxa de 42% demagogicamente propalada pelos teóricos da ganância, a que se junta o vice-presidente do PSD. De facto, de acordo com os dados disponibilizados pela Direcção de Serviços do IRS, em Março de 2011, é possível concluir que, nos agregados familiares com rendimentos superiores a 100 mil euros, a taxa efectiva de IRS corresponde, em termos médios, a 28,2%, ou seja, muito longe daquilo que é referido pelo vice de Passos Coelho. Estamos a falar de 52.036 famílias com rendimentos globais equivalentes a 8.176 milhões de euros, valor que devia estar sujeito à taxa real dos 42% e não a esquemas que a reduzam a 28,2%. – as 3.736 famílias com rendimentos superiores a 250 mil euros tiveram um rendimento de 3.736 milhões de euros, tendo pago 571 milhões de euros em IRS, ou seja, foi-lhes aplicada uma taxa efectiva média de 35,5%. Daqui decorre que entre a fama e o proveito no que diz respeito à taxa de 42% vai uma grande distância, em beneficio, naturalmente, dos rendimentos mais elevados. Mas também há que ter em conta a situação das famílias da vulgarmente designada classe média,cuja definição corrente assenta no conceito de classes definida, à trouxe-mouxe, pelo capitalismo, em oposição ao conceito marxista que a define na base da detenção dos meios de produção. Por razões ligadas à tradição vigente admitamos, em teoria, que a chamada classe média,e as suas subdivisões em baixa, média e alta, abrange, no plano dos impostos, as famílias com rendimentos entre um mínimo de 19 mil euros e um máximo de 100 mil euros. Pois bem, estas famílias suportam 67% do pagamento do IRS ao Estado, enquanto as famílias com rendimentos superiores a 100 mil euros suportam, apenas, 28,2%, realidade silenciada pelo vice-presidente do PSD. Este assunto, o imposto sobre pessoas singulares, em função do acordo das troikas, a interna e a externa, vai tem grandes implicações no rendimento disponível das famílias. As troikas que, cinicamente, não dedicaram uma linha sequer às profundas desigualdades sociais existentes em Portugal, tomaram, ao invés, medidas tendentes ao seu agravamento. – Diário de Notícias, de 17 de Maio de 2011. Francis Jameson, com uma extensa obra sobre o pós-modernismo, escalpeliza as íntima relações entre o pós-modernismo e as generalizações sociológicas que anunciam um novo tipo de sociedade que alcunham de sociedade pós-industrial. Argumenta que «qualquer que seja o ângulo de análise sobre o pós-modernismo na cultura e nas humanidades tem necessariamente uma posição política, implícita e explícita, com respeito à natureza do capitalismo multinacional dos nossos dias (…) à lógica desse capitalismo tardio». O pós-modernismo produziu deliberadamente a perda de historicidade, a fragmentação do pensamento, o esvaziamento do pensamento ideológico que retira sentido aos partidos políticos que se tornam um fim em si-próprios, organizações eleitorais sem definição nem mobilização ideológica, representando determinados interesses económicos que lhes dão apoio variável e pontual. O resultado é visível a olho nu quando se procuram diferenças entre as práticas políticas do PS, PSD e CDS. A democracia, despida da retórica em que se procura confundi-la com esses partidos, é cada vez menos uma realidade correspondente ao ideal democrático. O paradigma democrático do voto como expressão da vontade popular, quando usado para votar num desses partidos, é um voto perdido para a democracia. Nas outras áreas, a expansão do pós-modernismo é devastadora. Nas artes, o apagamento das fronteiras entre culturas, a chamada alta cultura e a cultura popular, produziu uma polpa onde flutuam objectos e produtos sem outro destino que não seja o da exploração publicitária do trabalho formal. As ciências sociais foram tomadas de assalto pela miséria do pensamento. O político, o intelectual, o artista ideologicamente comprometido cederam o seu lugar a uma espécie palrantes todo-o-terreno, especializados nas banalidades com que vendem as virtudes de uma sociedade que rasurou toda e qualquer espécie de dignidade para lutar pela sua sobrevivência. O espectáculo a que diariamente se assiste, vendo, ouvindo e lendo os meios de comunicação social, é deprimente. O pós-modernismo pauperizou o pensamento e o sentido de humanidade. Produz máquinas de imagens que o reproduzem nos ecrãs das televisões e dos computadores, nas redes sociais, nas montras dos centros comerciais. Mede a pulsação da vida pelos resultados económicos. Transforma a ciência económica que Marx tinha elevado à condição de ciência social e humana por excelência, na aritmética grosseira do deve e do haver. As ciências sociais e humanas, em particular a sociologia, foram despojadas de ambição para se venderem no que é imediatamente mais rentável. O que é seguido, no seu essencial pelo ideal do saber universitário cerceado por critérios económicos que impõem cursos e especialidades consideradas mais vendáveis. É extraordinária a sucessão de gurus que se atropelam para debitar mais do mesmo, com papel de embrulho diferente. Quanto mais o pensamento é esquelético mais se vende a ideia de líder e de líder excepcional com que se procura preencher esse vazio. A literatura, os textos de opinião, as pós-graduações e doutoramentos em liderança são abundantes, por mais insustentável que seja a sua leveza. Os pensadores líderes do pensamento pós-moderno consideram que a ideia moderna de racionalidade global acabou por se «desintegrar numa unidade plural de mini-racionalidades, ao serviço de uma global e incontrolável irracionalidade». Enunciam como única saída possível «a reinvenção das mini-racionalidades da vida de modo a que deixem de ser partes do todo e passem a ser totalidades presentes em múltiplas partes». Seria essa a lógica de um pós-modernismo de resistência com tradução política nos blocos de esquerda. É um pensamento labiríntico e hermético que, abandonada a trincheira de uma suposta resistência, coado e passado a limpo para a política do quotidiano, se traduz no populismo rasca com que vende a ideia neoliberal onde a alienação do homem é central. Descascada essa retorcida batata filosófica percebe-se que essa suposta resistência pela «reinvenção de mini-racionalidades» é o exercício de pacificação da «global, inabarcável e incontrolável irracionalidade». A ritualização e encenação de artifícios de sobrevivência que constroem o casulo de onde a pós-modernidade não voará borboleta, porque essa tese, nuclear do pensamento pós-moderno, é a mentira da sua própria razão. Há uma poderosa máquina difusora informativa e de propaganda que pretende tornar credível a ideologia pós-moderna e um suposto pós-história, pós-economia, pós-política, etc, que quer ser o horizonte final da sociedade, onde toda a conflitualidade se resolveria por intervenções gestionárias. Acaba por se alimentar dos seus próprios resíduos. Peças fundamentais dessa máquina são as ciências humanas numa deriva que promove um saber para-mágico. Para rasurar qualquer dúvida, um dos mais eminentes pensadores pós-modernos portugueses, teorizando sobre filosofia das ciências, defende que para o avanço do conhecimento científico é tão importante a matemática ou a física como a astrologia. É esse o palco onde a miséria, o aviltamento, a devastação das ciências sociais e humanas se exibe para aplauso de Belmiros, apaniguados serventuários, como se pode ler nas intervenções que vão plantando na comunicação social. As ciências sociais, no seu conjunto, têm que readquirir o seu estatuto original para se imporem aos poderes actualmente hegemónicos e integrarem a luta política, como o preconizaram os seus pensadores maiores, Marx e Engels, que é cada vez mais urgente e actual ler e reler. Um dos ataques mais graves ao «Estado social» é a recusa de um direito fundamental a centenas de milhares de portugueses, que é o direito ao trabalho e a um emprego digno consagrado na própria Constituição da República. Ora este direito fundamental é negado cada vez mais a milhares de portugueses, como revelam os dados do INE constantes do Quadro 1. Os dados sobre a evolução do desemprego em Portugal mostram que, entre Janeiro de 2009 e Janeiro de 2011, se verificou em Portugal um aumento contínuo e elevado do desemprego. Nesse período, o desemprego oficial passou de 495,8 mil para 688,9 mil (+193,1 mil) e o desemprego efectivo cresceu, no mesmo período, de 624,3 mil para um milhão e seis mil (+382,3 mil). É evidente a negação de um direito que caracteriza qualquer «Estado social» a um número crescente e inaceitável de portugueses. Entre o 4.º Trimestre de 2010 e o 1.º Trimestre de 2011, verifica-se um aumento anormal e muito grande do desemprego que convém analisar e explicar até para que fiquem claras as razões desse salto no desemprego. Na televisão, por exemplo, quando alguém se refere a esta questão, a resposta habitual é «a mudança de metodologia» o que, para a opinião pública, é natural que pouco diga. No entanto, a explicação torna clara as deficiências que têm as estatísticas oficiais do desemprego em Portugal. Entre o 4.º Trimestre de 2010 e o 1.º Trimestre de 2011, o desemprego oficial aumentou de 619 mil para 688,9 mil (+69,9 mil); a taxa de desemprego oficial subiu de 11,1% para 12,4%. O desemprego efectivo, durante o mesmo período, cresceu de 768,9 mil para 1006,6 mil (+237,7 mil), e taxa efectiva de desemprego aumentou de 13,6% para 17,7%. Este aumento tão elevado no desemprego em Portugal não resultou de uma alteração radical na situação real verificada no desemprego e na taxa de desemprego em apenas um trimestre, mas tem fundamentalmente como causas o facto de anteriormente muitos portugueses serem considerados pelo INE como estando empregados quando efectivamente estavam desempregados. Assim, segundo as próprias «Estatísticas do Emprego» do 1.º Trimestre de 2011 (ver págs 34 e 35), até ao fim de 2010 eram considerados como estando empregados todos «os indivíduos que efectuavam um trabalho não remunerado para uma pessoa de família ou com vista ao auto-abastecimento». A partir do 1.º Trimestre de 2011, tais indivíduos passaram a ser, segundo o INE; «classificados como não empregados, tornando-se elegíveis para a classificação posterior como desempregados ou inactivos. Esta circunstância ajuda a explicar a redução observada na população empregada e o aumento da população desempregada e inactiva», e nomeadamente nos «inactivos disponíveis», os quais, entre o 4.º Trim-2010 e o 1.ºTrim-2011, aumentam de 78,9 mil para 143,8 mil. Também se verificou alterações na definição de «subemprego visível» em que passaram «a ser consideradas as horas habitualmente trabalhadas em todas as actividades (principal e secundárias) e não apenas na actividade principal, como era anteriormente. 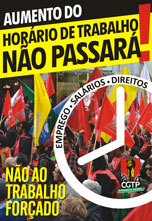 É também introduzido um critério de disponibilidade para começar a trabalhar as horas pretendidas, o que certamente explica o aumento de 71 mil para 173,9 mil verificado entre o 4.ºTrim-2010 e o 1.º Trim-2011. Este facto associado ao aumento registado também nos «inactivos disponíveis» explica a elevada subida registada no desemprego efectivo que, durante o mesmo período, aumentou de 768,9 mil para 1006,6 mil. Como o próprio INE reconhece, as mudanças introduzidas «proporcionam um maior rigor na identificação desses indivíduos e na captação das situações de fronteira». Portanto, era desemprego que, na sua maioria, já existia, mas que estava oculto e que agora se torna visível. Pela «anterior metodologia» a taxa de desemprego oficial só teria aumentado, entre o 4.º Trimestre de 2010 e o 1.º Trimestre de 2011, de 10,9% para 11,4%, e o número oficial de desempregados só teria subido de 619 mil para 633,3 mil, ou seja, menos 55,6 mil do que o número oficial de desempregados. Este facto vem confirmar as críticas que fazíamos de que o número oficial de desempregados não era real, pois estava muito abaixo do efectivo. Apesar da melhoria verificada é de prever que a verdadeira situação ainda seja mais grave. Existe uma correlação negativa, ou seja, inversa entre a taxa de variação do PIB e a taxa do desemprego. Isto significa que quando o PIB cresce a taxa de desemprego diminui; e, inversamente, quando o PIB diminui a taxa de desemprego aumenta. O gráfico 2, construído com dados divulgados pelo Eurostat e pela Comissão Europeia (Stastical Annex of European Economy – Spring 2011), mostra essa correlação negativa entre o PIB e o desemprego para o período 1996-2012 em Portugal permitindo tirar conclusões importantes. No período 1996-2000, o PIB cresceu em média 4% ao ano, e a taxa de desemprego caiu de 7% para 4%. A partir de 2000 e até 2010, verificou -se um crescimento anémico – a média do crescimento foi inferior a 1% por ano – e a taxa de desemprego disparou tendo atingido cerca de 11% em 2010. Como mostra o gráfico 1, só em 2007, com uma taxa decrescimento económico de 2%, é que se verifica uma pequena paragem no aumento da taxa de desemprego. A partir de 2010, com a entrada de Portugal em recessão económica, o ritmo de aumento da taxa de desemprego vai inevitavelmente acelerar-se ainda mais, prevendo-se já antes da mudança de metodologia que a taxa oficial de desemprego atinja 13% em 2013 (agora com a nova metodologia, a taxa oficial de desemprego será certamente superior a 14%). É evidente que taxas de crescimento económico anémicas e recessão económica determinam um aumento contínuo do desemprego em Portugal. Para inverter esta situação é preciso não só produzir mais como tem sido dito, mas também aumentar o consumo de produtos nacionais, o que tem sido esquecido. Nada serve produzir mais se depois esse acréscimo de produção não se conseguir vender. E neste campo haverá que pressionar e mesmo tomar medidas para alterar a política de compras das grandes empresas distribuidoras que, movidas apenas pelo lucro, preferem vender produtos estrangeiros, preterindo a produção nacional. É exemplo disso a cadeia Pingo Doce de Jerónimo Martins, que é o 5.º maior importador de produtos estrangeiros, contribuindo assim para o endividamento crescente do País. A pressão da opinião pública era também importante. As medidas do «Memorando» levam à destruição da produção nacional. O gráfico 2, construído com dados divulgados pelo INE (número de desempregados) e pela Segurança Social (desempregados a receber subsídio), mostra de uma forma clara que o desemprego e o apoio aos desempregados têm evoluído em Portugal em sentido oposto. No 1.º Trimestre de 2009, o desemprego oficial atingiu 496 mil, e o número de desempregados a receber subsídio de desemprego somou 299 mil, ou seja, correspondia a 60,4% do desemprego oficial. No 1.º Trimestre de 2011, o número oficial de desempregados atingia já 688,9 mil (o desemprego efectivo atingiu 1006,6 mil), mas o número de desempregados a receber subsídio de desemprego era apenas 293 mil, ou seja, somente 42,6% do desemprego oficial. Em 2011-2013 a situação agravar-se-á pois, segundo o «Memorando de entendimento», o PS, o PSD e o CDS comprometeram-se a reduzir ainda mais o apoio aos desempregados em 150 milhões de euros. E isto apesar do aumento elevado que se verificará no desemprego em Portugal. Com o aumento do desemprego, a pobreza está a aumentar em Portugal. Apesar disso, o número de portugueses a receber o Rendimento Social de Inserção não tem parado de diminuir. 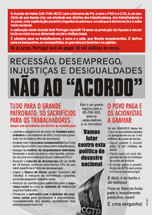 Entre Jan.2010 e Mar2011, o número de beneficiários do RSI passou de 428 mil para 331 mil. No período 2011-2013, segundo o «Memorando de entendimento», o PS, o PSD e o CDS comprometeram-se a reduzir a despesa com este apoio social em 350 milhões de euros. Outro apoio social que sofreu uma quebra significativa foi o das bolsas do ensino superior. Cerca de 20% dos estudantes (mais de 12 000) perderam o direito bolsa em 2011. O ataque ao «Estado social» é global e não se limitou apenas à redução de 603 mil crianças a receber abono de família entre Janeiro de 2010 e Janeiro de 2011 (passou de 1 772 000 para 1 119 000 segundo a Segurança Social). Afinal, contas feitas, a descida da famosa «Taxa Social Única» (TSU) só reduz custos de empresas em 0,8%! Concretamente, a redução da TSU em quatro por cento – número exigido pela troika nesta sua «medida emblemática» - apenas gerará uma poupança para as empresas inferior a um por cento dos custos totais de produção. Portanto, quando a troika faz fincapé na redução da TSU neste quantitativo, sob o pretexto de que tal irá «reduzir custos e promover a competitivdade» nas empresas, está a mentir com todos os dentes da bocarra. Em contrapartida, o que de certeza tal corte provocará... é uma significativa redução do dinheiro que hoje entra na Segurança Social, pondo seriamente em risco a sua solidez e, de seguida, a sua viabilidade. Isto, a troika não diz – mas é o que visa com esta «medida emblemática». Ao que parece, metade do sangue doado em Portugal (que, por sinal, bate recordes mundiais neste generoso empenho de doar sangue graciosamente) vai... para o lixo! Razão: há falta de equipamentos que permitiriam extrair derivados de plasma do sangue recolhido, pelo que esses mesmos derivados continuam a ser importados do estrangeiro pela «módica» quantia de 70 milhões de euros /ano. Além disso, bastaria um protocolo com a vizinha Espanha – segundo diz o presidente do Instituto do Sangue – para resolver este problema da «falta de equipamentos» para extração de plasma. Espanha possui um centro desses e Portugal, com meio milhão de dadores, tem deste 2004 um superavit de sangue de primeira qualidade, pelo que o negócio interessaria a ambos os países e, sobretudo, seria vantajoso financeiramente para ambos. Entretanto, foi também notícia que a Administração Central do Sistema de Saúde (ACSS) não sabe qual é a actual capacidade instalada em equipamentos e instalações... do Serviço Nacional de Saúde! No mesmo dia em que o Presidente da República, Cavaco Silva, perorava no discurso do 10 de Junho que é preciso «reanimar a agricultura», foi notícia de que há em Portugal 220 mil agricultores que são pagos para não produzir com subsídios da União Europeia – esquema, aliás, que já vem do tempo dos governos próprio Cavaco Silva. ¿Qué decidió el Club Bilderberg para Libia? Quoi de neuf dans le salariat? Qui a peur de la démondialisation ?